I had very little sleep as the campsite was very crowded in the tent area and loud parties went on to 4 am. My newly acquired map of Spanish campsites showed several sites to the north of La Coruna so I set off fairly early at 7.30 am to ride the 50 or so miles to that area. 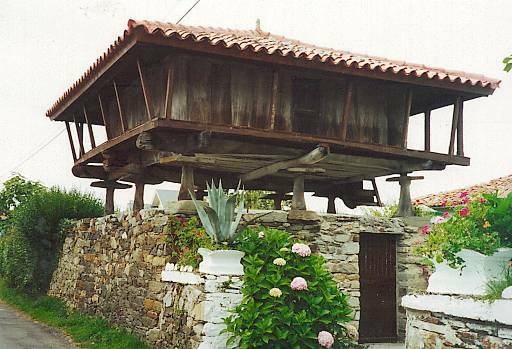 The route took me up the N550 road to Meson do Vento where I took the smaller C542 road to Betanzos. Betanzos was a strange touristy town that with its street cafes and amusement arcades gave the impression of being a seaside resort except it was several miles inland. The road from Santiago was fairly flat for the first 5 miles but from there on it became progressively more hilly, basically riding up a hill for about forty five minutes at 3.5 mph in the bike’s lowest gear and then flying downhill at 35 mph for a few minutes before starting the next forty five minute climb. The trouble with this is it appears that for every 10 hours riding 9 are uphill and it begins to wear you down. Added to this was the fact that this area of Spain was not very interesting, mainly eucalyptus plantations. There was a headwind and it was very hot. Next time I will catch a bus, this was not fun. I did not manage to find any of the camp sites marked on the map around La Coruna and had to ride on to the next one marked at Ferrol. It was very hard work in the hilly countryside and the sun, by far the hardest day of the whole trip. 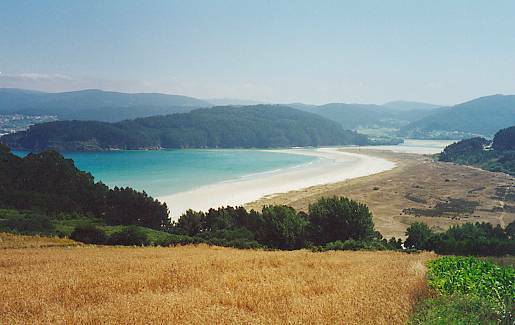 When I eventually arrived at Ferrol and asked at the tourist office where the campsite was I was told it no longer existed, the nearest one was another 15 miles up the coast. Although 15 miles might not sound far, to me having already cycled for seven hours up nearly 60 miles of steep and long hills it could have been the moon. I really did not think I could manage another 2 hour ride even though the girl at the tourist office said the road to the camp site was much easier than the road I had been on. She said she had cycled it herself in an hour and a half previously. Ferrol is a navy base and shipbuilding town set in a spectacular inlet with a long bridge approaching it. The town itself was rather ugly with large blocks of flats and few, if any, interesting buildings that I could see. The shipbuilding yards seem to have virtually closed and the town has a run down, anarchistic sort of threatening feel about it with slogans painted everywhere, presumably by out of work ship builders. I enquired at a couple of hostals as to the cost of a bed for night, £35 and £45 per night. This was much more than I wanted to pay so despite the fact that it was 8 pm and I was exhausted I set off to try and get to the next camp site before dark. Luckily the tourist office girl was correct, the road was reasonably flat and I made the camp site by 9.30, just in time. The camp site at Valdivino was a good one next to a large beach with a lively bar, small shop and a restaurant. After a shower, meal and a few beers my batteries charged up a bit. I decided to spend the morning tomorrow on the beach and not attempt another 15 hour ride (9 in the saddle as it were). This area of Spain will have a permanent black mark as far as bike riding “para mi” is concerned! I spent the morning, or a couple of hours of it anyway, on the beach and set off around midday. The hills were horrendous, even worse than yesterday perhaps, but as there were a several pleasant coastal bits with spectacular views the monotony of constantly slogging uphill in a eucalyptus forest was broken so it didn’t seem as bad. I remember thinking that perhaps life itself is like a bike ride, it seems all uphill but of course the downhill bits cover the same distance over the ground. “Hello eucalyptus tree, come here often?”. The road passed through Cedeira and Ortigueira and was generally just light traffic, maybe because it was a Sunday. It was cloudy but very hot so I had taken my shirt off hoping to be cooler riding uphill. This was a mistake. By the time I arrived in Viveiro I had a sunburnt back for the first time. It is true what they say, “you can get sunburnt even in cloudy weather”. Yes, yes! 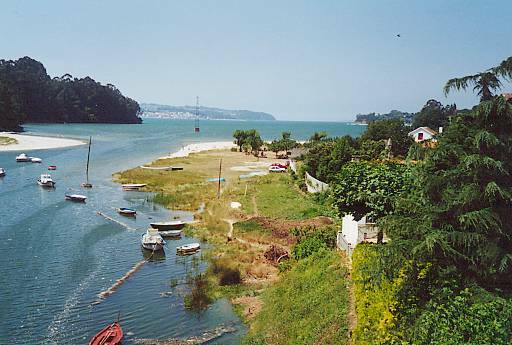 Viveiro is a seaside resort set at the head of a large inlet. 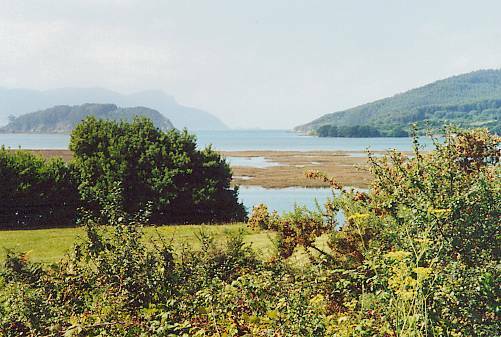 The camp site, unusually, was just a short walk from the town. I met Dan and Matt, two young cyclists from Humberside. They had cycled down through France from Dover and were heading south through Portugal over the next two months. They originally were in a group of four but two had given up in France and gone home due to the awful weather. Yes, they were in the same area at the same time as I had been. They had very expensive looking bikes and lightweight kit. It turned out that Matt had been an English mountain bike champion of some sort and they both had worked in a bike shop. They were starting university when they returned to England. When I told them about my burst tyre experience in Biarritz they said I was lucky, they had had four burst tyres and several collapsed back wheels between them as well as other bike troubles. The road out of Viveiro was a ten mile uphill slog but after that it was relatively flat (by Spanish standards anyway). Although I was following the coast road nearly all of the time it was three or four miles inland and not much fun as the traffic was very heavy due to the fact that, as yet, there is no alternative motorway or any other main road. Matt and Dan had come this way and had said there was a small, quiet road actually on the coast although it was much more hilly and slower. My map didn’t show any coast road as it was too large a scale. Despite my aversion to hills I thought it would be better to try to find the coast road as the main road was rather dangerous with the heavy traffic. Also although it had the usual narrow bike lane it was difficult to use because when the road had been re-surfaced the new layer ended in the centre of the bike lane with a three inch drop to the old surface. This only left a strip about nine inches wide to ride on and I had nearly fallen off my bike on several occasions when the front wheel had hit the edge of the new surface (left leg hop syndrome?) or the large stones on the roadside verge. I tried several small roads to the coast but they were all dead ends. Again this is not an area of Spain that I would recommend for a cycling holiday as it is rather like exploring Cornwall from the Redruth bypass. The one interesting town all day was Ribadeo, although perhaps that is a bit unfair on some of the small seaside villages such as Foz. Matt and Dan had said that they had stayed at a good camp site on the cliff top at Luarca so that was where I was heading. However I must have missed the turning off the main road and ended up about twelve miles further on at Cadavedo. I decided to stay at Cadavedo for two nights partly because it was rather a pleasant little village with a excellent campsite, and partly because having covered over 200 miles in three days I was way ahead of schedule. There was no point in arriving at Santander a week before Kath. A day off, wow, a bit like a holiday within a holiday. The morning I spent on the beach about a mile from the campsite. It was a pleasant spot with steep cliffs and a small hut selling beer, ice-cream and coffee. I had a coffee then a beer and went and sat on the beach. The day was overcast with no wind, ideal for bike riding, I thought, but not for sitting on the beach. I went back to the hut and had a couple more beers, a coffee and an ice cream before returning to the camp site. During the afternoon I wandered around the village looking at the horreos (elevated barns on "mushrooms") that are a feature of the area. There are dozens of them in Cadavedo, most of them now converted to living accommodation. In this area they are usually built of wood, roughly about 20 feet square and sit on stone or wooden “mushrooms”, themselves sitting on a stone lower wall. The steps hang from the barn with no bottom step as it were, apparently to keep out rats, as is the idea behind the “mushrooms”. Back in Galicia, where I first saw them, they have smaller, narrower versions of the ones here. I had a swim in the camp site pool but like most other pools in Spain I had to wear a tight rubber cap which was uncomfortable. Goodness knows why anyone would choose to wear tight rubber things, still each to his/her own. I rather liked Cadavedo with it’s friendly camp site. Nasty main road again but at least Maria from the campsite had told me there was very rarely a small coast road alternative so I just followed the main road without wasting time trying the inevitable small side road dead ends to the coast. I don't think it is the traffic itself that bothers me, most drivers in Spain (and France for that matter) respect cyclists and give them a wide berth often tooting their horn as a warning when approaching, however what I did find worrying was the fact that every 100m or so there seems to be a large lump of lorry tyre on the roadside. The road was also very hilly but by now I just accepted this and rode stoically up every hill thinking of England (or more likely Holland). Aviles came into view. 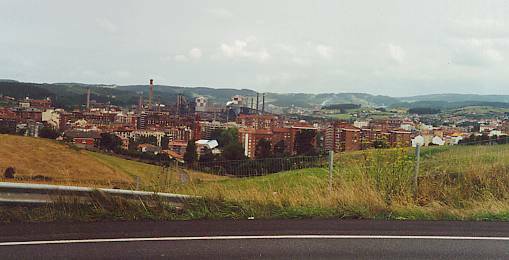 Basically Aviles is a large steelworks and about the ugliest town I had seen on this trip so far. I just rode through it without stopping. Just outside of Aviles on the by now dual carriageway road a lorry joining from a side road pimped his horn at me and the driver wagged his finger. Yes the road I was on had turned into motorway without any warning "no cyclists" signs. I had to push the bike the wrong way up the side road for a couple of miles before I found a place where I could lift the bike over the crash barrier, down the embankment and through a hole in a wire fence into a run down housing estate. Back in Aviles I asked if there was an alternative road to Gijon, there seemed to be one marked on my map but I was unable to find it. I spoke to three people and they all said there was an alternative route but you could only get to it after cycling down the motorway for a couple of miles, Catch 22. Perhaps this was why I had not seen any “no cyclists” signs and perhaps cyclists were allowed on the first couple of miles of this motorway after all. Rather than have another attempt at the motorway I cycled around the problem by taking a ten mile detour to Luanco on the north coast. This was probably a good move. Luanco is a typical seaside resort slightly reminiscent of St. Ives. I wandered around for a couple of hours and walked along the promenade asking at the various ice cream stalls where the camp site was without any luck. There was either no camp site or they didn’t understand my Spanish / pointing at my tent mime. Later, by now full of choc ices, I found the tourist office and asked. Yes there was no camp site at Luanco, only one further up the coast near Candas. I spent most of the afternoon wandering around / sitting on the beach / looking in shop windows and went on to the campsite a few miles along the coast at about 5. At the camp site I was informed, in broken English “the hot showers are free”. Strange? I thought, they usually are. Later I found out what was actually said was “the hot showers are frio (cold)” the standard bottle gas heater had broken down. At a bar next to the camp site I witnessed a strange ritual. On the bar was a bottle of something and most people when they first came in would hold a glass in one hand as low as possible and with the other hand they would attempt to pour the liquid into the glass from as high above their head as possible. This was a messy business as most failed to get any in the glass at all. It turned out that this was the local cider drinking custom. Apparently the cider is so rough it needed to be poured from a height in order to produce a slight head (for a very short time!). The cider was available in most bars and shops and came in a bottle without a label, which should be returned rather like milk bottles in England. It was very rough and cloudy but tasted OK although at £1.50 it was no cheaper than the wine, still, makes a change.